The day will start with a scientific meeting followed by Registration at 08:30 and Coffee on Academic Street, Level 3. Lunch will be provided. The ORICS meeting will be organised by Dr Peyton Davis. Most Original Poster – any category. The STC meeting will follow at 16:00. Please fill in the booking form below if you wish to attend and/or submit a poster and email the form back to Trish Greenall. Email oxfordecho@gmail.com for more information. With our ARCP dates looming and the requirement to reflect formally now a reality, the anaesthetic registrar teaching OXDAT organised a training day last month via the deanery with Mcguire healthcare. The Royal Berkshire Hospital is set to run its next Focused Intensive Care Echo course on 1st of May 2015. This is a 1 day course aimed at those working in acute specialities with an interest in basic echocardiography and the use of ultrasound in acute decision making, the accreditation then comprises a logbook of 50 scans within a 1 year period. Further information available at http://www.ics.ac.uk/ics-homepage/accreditation-modules/focused-intensive-care-echo-fice/. The course is approved by the ICS and will take the same format as previous years. The day comprises of some mandatory lectures but with maximal hands on experience. Candidates will image patients with normal studies and progress to identifying pathology later in the day. Lunch provided. contact james.watchorn@royalberkshire.nhs.uk for further details and application. discounted to £100 for those within Thames Valley Deanery and free for RBH employees. The ORICS Spring meeting is to be held in Milton Keynes hospital on the 22nd of April. It will be of interest to anyone who works in or interacts with an ICU in the region – with medical updates, and a look at how we manage the DGH patient awating transfer to an ECMO centre. There is a poster competition for trainees with prizes – deadline end of March – use the form below to submit your abstract now! – There are two levels of entry: 1) Basic/Intermediate 2) Advanced and topics can include audit, research or case reports – anything related to ICM. · The Behavioural Understanding Course: this course is held over 1.5 days and looks at non-technical skills related to trauma team leadership. Lecture and practical exercises on the first day cover human factors, concepts of crew resource management (CRM) and team resource management (TRM) and puts them into the context of Trauma Team leadership. This is followed by a day of simulation scenario training allowing participants to put into practice what they have learnt. · The Oxford Advanced Trauma Skills Course (Beyond ATLS): This course is run over 3 days and concentrates on the core knowledge and practical skills that are beyond ATLS understanding and reviews the most recent practices and research related to major trauma clinical management. Two days of lectures and practical sessions are followed by a day in the simulation centre tackling some the most serious trauma scenarios that may be encountered. 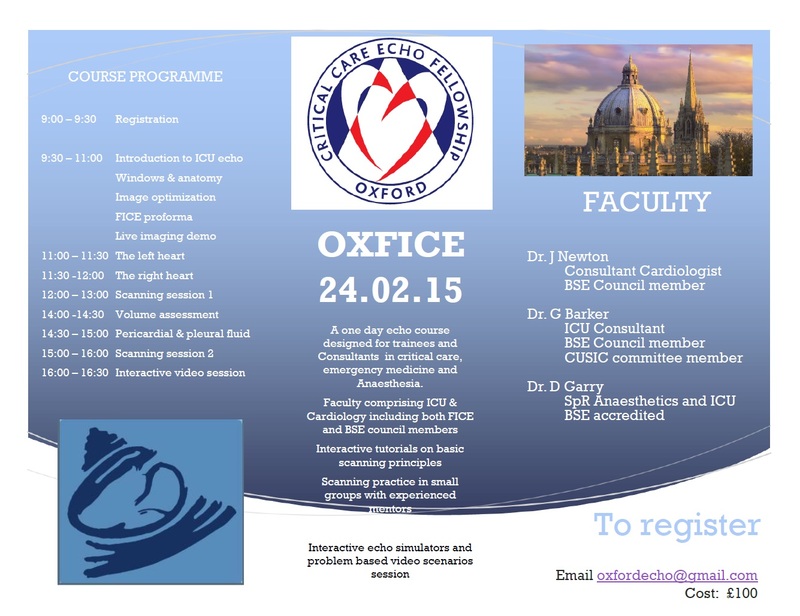 The next FICE course is on the 24th of February in Oxford – free for Oxford trainees. The event will run from 9am – 5pm at Park House, University of Reading Whiteknights Campus. The morning sessions will focus on trauma pre-hospital and in the Emergency Department. Additionally the Kadoorie prize has changed this year – see the rule sheet for details – submissions are on the day but need to be in poster format. Please contact Trish Greenall at Trish.Greenall@ouh.nhs.uk or Tel: 01865 220621 to reserve your place.